While a ship piloted by Ghosts can react quicker, travel further and need far fewer resources than a human-piloted vessel, a physical presence is still required for a crew to perform most of the tasks people are willing to pay big money for. The game’s solution for this is drones. 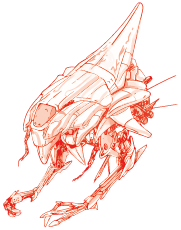 A robotic shell housing a modified Ghost core, each drone is precisely tailored for their Ghost and is much an extension of them as a living person’s hand. The core in the drone runs an up-to-date version of the Ghost, experiencing the world from the drone’s perspective. 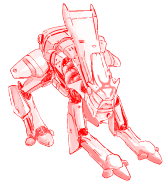 Their experience is streamed back to the Ghost’s main core back in the ship, which is in a trance as they incorporate the drone’s feed into their memory and personality. Thanks to the delicately engineered link between the two cores and streaming algorithms that prioritise which sensations and thoughts to stream based on available bandwidth, the experiences of the drone core are seamlessly integrated into the Ghost’s mind. Meanwhile, the locally present Ghost core allows the drone to function well even when the signal back to the ship has been cut or the time delay back to the ship becomes too great. They give you a physical body, meaning that your interaction with the world isn’t limited to command prompts and communication channels. They mean there’s a sense of risk and danger to missions that’s a step less severe than the ship blowing up. They provide a means of customisation and personalization, helping the players express their character’s personality at the table. Your main choice when picking your drone is its Frame. This gives you the basic environment the drone is built for, and the particular actions it’s proficient at. Frames have three ratings of particular importance: how durable they are, how quickly they can move, and how dextrous their manipulators are. At game start, there are three Frames available, but more will unlock according to events in the solar system. The squat, bulky Humanoid frame is impossible to confuse for a human, but still allows you to perform most human-scale tasks. Pros: High manual dexterity, humans find it easier to interact with, can pick up and operate designed-for-human equipment. Cons: Low durability, limited space for mods and extra functions. Light weight and an array of thrusters make this frame perfect at manoeuvring in zero-g.
Pros: Can explore zero-g environments with ease, can run indefinitely on solar power, plenty of space for mods. Cons: doesn’t cope with gravity, distance from human body plan means it’s not very good at relieving Discarnate stress. With a rugged chassis and the ability to walk, swim and dig, this frame is great for missions on or beneath the surface of hostile planets and moons. Pros: High durability, can operate in most environments. Cons: low dexterity, difficult to retrieve once dispatched to a planet’s surface. Its memory buffer becomes too full, meaning that some memories are erased. It gets destroyed, preventing the transition back to ship-Ghost from being cleanly managed. It gets isolated, such that it starts operating independently of the ship-Ghost. It can’t be retrieved, meaning you must go the rest of the flight without incarnation.